Just a quick post tonight to share a sneak peek with you of the Our Daily Bread designs stamps to be released Aug. 1. OMGoodness! This month is my most favorite yet of all the releases!!! I'm blown away at all the sets coming out and I love love love every one of them! Tonight I'm sharing parts of three sets. Sew Special, Spool & Tape, and Pin Cushion. I used Bazzill for a base and The Paper Studio for most of my designer paper. I stamped with Memento Ink and colored with Copics. I used a cute Cuttlebug edge embossing folder that looks like zig zag stitches and sponged with distress inks. The lace is a gift from a sweet friend, the crocheted flower was won in a challenge, and the buttons are from my button box. I cannot wait to show you all the sets and what all the DT have been making with them!!! Please don't miss the Aug 1 Blog Hop beginning at the ODBD Blog! My sister is here and we are leaving tomorrow for a short trip together but our time is short as she'll be going home Sat. :( We've had a wonderful time! I even got her to create a card and I will show it to you one day.... it came out gorgeous!!! Thanks so much for stopping by and for your sweet comments! They mean so much to me! This is so pretty. I can see why you like this set. 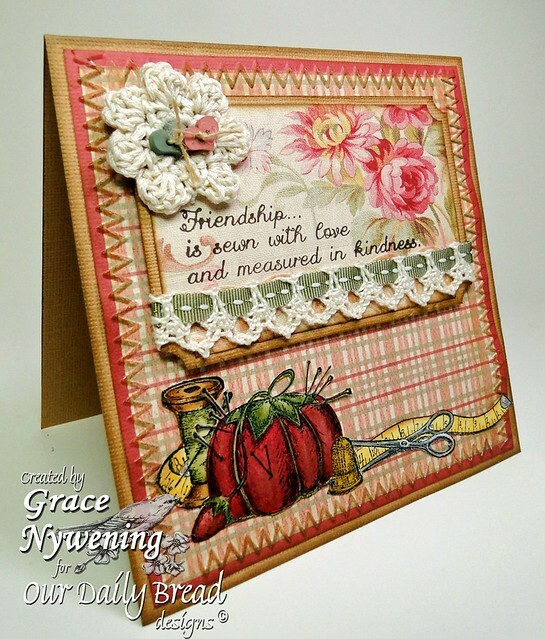 Oh Grace this is just amazing - all the details just serve emphasize the stamps.... I am close to breaking the 10th commandment without even seeing the release!! Grace, this is gorgeous! You colored the notions so beautifully and the combination of papers and embossed stitching is fabulous! Lovely card! I hope I get my sets soon! Love this! This is a lovely card - I really appreciate all the little details on it and the composition, so clearly thought out. Great job! The Design Team are really pleased that you joined us for the Simon Says Stamp and Show Challenge this week - Thank you! Beautiful card - I love how everything speaks to the same image - right down to the zig-zag edging! Thanks for joining us at Crazy Challenge - good luck. Gorgeous! Love the sewing theme, and that embossing folder is perfect for a zig-zag stitch look. How fun to spend time with your sister, even if it's short. Very pretty and looks like a great new set. Your crochet flower is awesome. Beautiful work! Very creative to insert the ribbon into the lace. Plus, love the stitching! Beautiful Card Grace. I love it. I have been answering everyone of your emails, but I don't think you are receving them. Yes midnight is great! Such a lovely card!! I love the sentiment...it goes so well with the image. Thanks for taking part in NettieG's 1,2,3 Digging in the Sand challenge. Thanks for playing along with us at NettieG's! Gorgeous card Grace, love the image and the crocheted flower is fabulous.Beautiful sentiment.